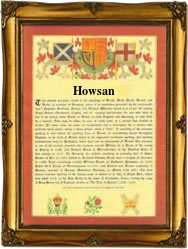 This interesting surname with variant spellings Huson, Hewson, Hooson, Hoosun and Hughson, means "son of Hugh". Hugh itself derives from the Old French personal name "Hu(gh)e", which in origin is a shortened form of any of the various Germanic names with the first element "hug", heart, mind, spirit and was a popular name among the Normans, due to the fame of St. Hugh of Lincoln (1140 - 1200), who introduced it to England. The surname itself first appears in records in the mid 11th Century, during the Norman Invasion of England (see below). One Richard Hughson appeared in 1310 in the Calendar of Letter Books of the city of London, while the Subsidy Rolls of Worcestershire record one William Huggesone in 1327. Henry Howsone was mentioned in the Subsidy Rolls of Cumberland in 1332 while a Michael Howesone was listed in the Court Rolls of the borough of Colchester in 1378. The surname is also found in Scotland where it first appeared in 1467 when Moris Howsone was listed in the Registrum de Dumfermelyn" on "Inquisition anent a fishing on the Tweed". John Howson (1557 - 1632), was Chaplain to Elizabeth 1st and James 1st and Bishop of Oxford from 1619-1628 and of Durham from 1628- 1632. The first recorded spelling of the family name is shown to be that of Wlfuric Hugo Sune, which was dated 1066, in the "Inquisitio Eliensis", during the reign of King William 1st, known as "the Conqueror", 1066 - 1087. Surnames became necessary when governments introduced personal taxation. In England this was known as Poll Tax. Throughout the centuries, surnames in every country have continued to "develop" often leading to astonishing variants of the original spelling.